MQ Whiteman Brand Power Trowels have been at the center of the concrete finishing world since 1939. Years of innovation and development have enabled us to offer the world's premier line up of concrete finishing equipment on the market today. MQ Whiteman InstaClutch™ walk-behind power trowels add a new dimension in our walk behind trowel line-up. This innovative clutch system immediately disengages the drive system should the operator release the handle. Engineered to provide the performance you expect and the reliability you depend upon. 4-blade, 46", Honda GX 270, 8.5, Min 60-130 Max RPM blade speed. 4-Blade,46", Honda GX340,10.7 HP, Min 60-130 Max RPM blade speed. 4-Blade,36", Honda GX160,4.8 HP, Min 60-115 Max RPM blade speed. 4-Blade,36",Honda GX270,8.5 HP, Min 60-130 Max RPM blade speed. 4-Blade,36", Subaru EX17,5.7 HP, Min 60-115 Max RPM blade speed. 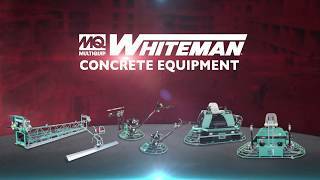 MQ Whiteman Pro Trowels redefine the capabilities of walk-behind concrete finishers. A unique design, featuring an integrated boom, enables application of a broom or fresno finish during the final trowel pass. It is ideally suited for parking structures, multi-story projects and jobs that do not require a burnished surface. 4-blade,36"Honda,GX270,8.5 HP, Min 60-130 Max RPM blade speed. 4-blade,46" Honda GX340,10.7 HP,Min 60-130 Max RPM blade speed. These workhorses tackle a wide range of applications and are perfect for accurate troweling of small to medium sized areas. Rugged parts, solid engineering and a variety of options make Whiteman trowels the best choice for concrete contractors. 4-Blade,30"/36",Honda GX160, 4.8 HP, Min 60-115 Max RPM blade speed.